The structure indicated is the opponens digiti minimi muscle. The opponens digiti minimi muscle is one of the intrinsic muscles of the hand that belongs to the hypothenar group. All the intrinsic muscles of the hand, except the thenar muscles and the lateral two lumbrical muscles are innervated by the deep branch of the ulnar nerve. The thenar muscles and the lateral two lumbrical muscles are innervated by the median nerve. A useful mnemonic for remembering this is MEATLOAF. “MEAT” refers to the Median nerve, and LOAF refers to the muscles which it innervates: Lateral two lumbricals, Opponens pollicis, Abductor pollicis brevis, Flexor pollicis brevis. 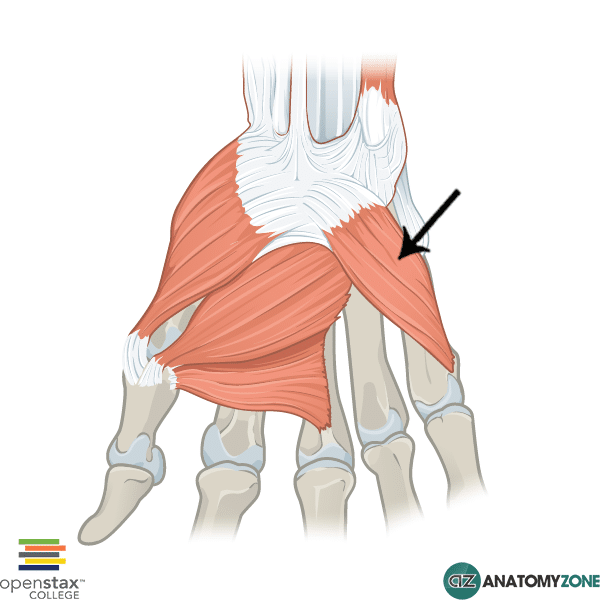 Learn all about the anatomy of the muscles of the hand in this tutorial.